Experience Colorado's glorious mountain scenery and wildlife on a morning tour from Denver. Admire the stunning ancient sandstone formations in Red Rocks Park. Travel to Bear Creek Canyon and observe elk, deer and buffalo in a picturesque mountain setting. Get a generous dose of history and captivating views at the Buffalo Bill Museum and Grave on Lookout Mountain. Upgrade to add on an afternoon coach tour of top Denver attractions for a complete day of sightseeing. After meeting in the morning at Union Station in downtown Denver, head west through the Rocky Mountain foothills in your comfortable, air-conditioned coach. Learn from your guide about the history and geology of Denver's mountain parks, a system of more than 14,000 acres (5,665 hectares) of recreational land just outside the city. 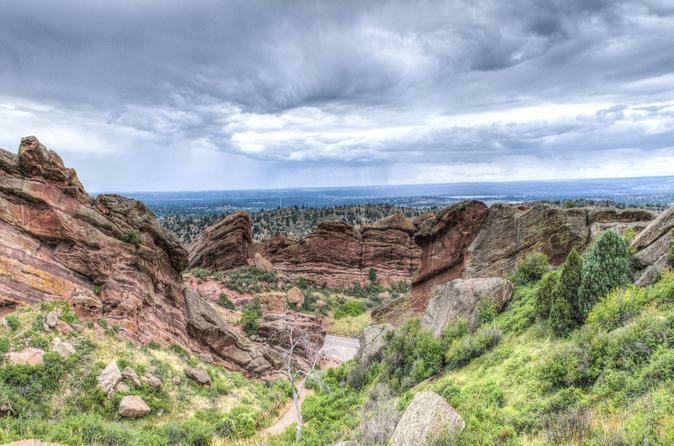 Visit Red Rocks Park and walk around admiring the towering sandstone rock formations formed nearly 300 million years ago. The park's dramatic natural amphitheater is a popular venue for concerts and other special events. Travel up Bear Creek Canyon, passing idyllic mountain towns and keeping your camera ready for possible deer, elk and buffalo sightings. On your way back to Denver, stop at Lookout Mountain and take in magnificent views of the surrounding hills and valleys. Here, visit the burial site of Buffalo Bill Cody and learn more about the Old West showman famous for his traveling cowboy shows during a guided tour of a museum in his honor. Following your morning mountain parks tour, have lunch (own expense) on your own before joining your guide for an afternoon round-up of top Denver attractions. Capture photos of landmarks including Larimer Square, City Park, the State Capitol, the United States Mint and the Denver Art Museum. See the skyscrapers of Denver's financial center framed against Rocky Mountain peaks, and witness the bustling scene at the 16th Street Mall, a downtown pedestrian mall offering dining, shopping and entertainment. With this upgrade, your tour lasts 9 hours total and concludes at Union Station in central Denver.